With carry-on luggage you can check-in on-line, print off your boarding pass, and head straight to the gate. No more waiting in slow moving queues and being shepherded like livestock around winding barriers; sandwiched between that moronic overweight couple and frenzied family of four. Disembarking, you can then be first to clear security and first to take in the sights of your new location; knowing fine well that the other passengers will all be sweating impatiently for the wailing buzzer that indicates the carousel has started spinning into motion. Last winter my cousin found herself high in the French Alps for a week of snowboarding and drinking with nothing but the tiger onesie she adorned. Not the most ideal costume in which to face blizzards and sub-zero temperatures. Her jacket, boots and board? Sitting in the lost property room at Edinburgh Airport, having failed to even be put on the plane. Now clearly if you are going snowboarding, golfing, or mountain climbing you’ll need to check in some form of sports or safety equipment; but this is only one of countless examples I could give of luggage being lost in transit. Does that two week beach holiday really require ‘everything but the kitchen sink’? You’d think that going somewhere with guaranteed sunshine would limit the amount of clothes one needs to pack, but time after time I see people traipsing through the airport looking more like like removal men than holiday makers. Instead, remove this risk completely by keeping all your stuff on you. It’s worth it just for the peace of mind. Depending on where you’re going it can be much more cost beneficial to simply buy stuff when, and if, you need it. I’ve come across some tourists who could initially be mistaken as travelling pharmacists, their wash bags an A-Z stocked medicine cabinet of tablets and drugs; remedies for any eventuality that might hit whether it be the common cold, ‘man-flu’, or diseases thought to have been eradicated in the 1800’s. Short of going to the remote Third World or Arctic Circle, leave these at home. Airlines already have severe restrictions in place for liquids and gels, so why go to the hassle of checking in luggage just to take these precautionary items? Suitable alternatives will more than likely be available in the local farmacia. And if you are still a paranoid android, why not simply invest in some better travel insurance? Secondly, taking only carry-on luggage will eliminate your ability to bring home tacky souvenirs and impulse purchases. Take the above photo for example. 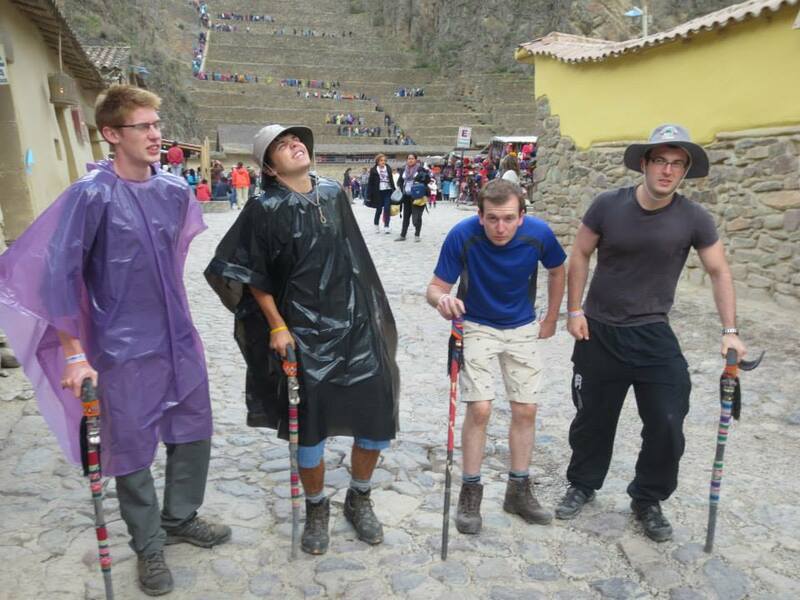 We saw those rather fetching wooden canes in the small town of Ollantaytambo, Peru. How hilarious would it be if we bought them? 4 gringos swaggering around as personified voodoo children. The answer: For a short while, yes! Four countries later however I was close to snapping the branch clean over my left thigh; the ergonomic mobility devices ironically managing to restrict our movements more than aid them. They were always getting in the way; getting caught in things; not fitting in taxis; and generally being a completely unnecessary nuisance. My new rule is this: If you want something that bad, Fed-Ex it home. If it’s that important, precious, and memorable it is worth the additional shipping charges. Otherwise, leave it and move on! Lugging around a massive rucksack will put out your back faster than a trip to an untrained back-alley chiropractor. Travelling light will prevent all sorts of fatigue and stretch injuries, whilst relieving the stress of using public transport completely. Squeezing suitcases onto crowded buses and trains is sure to rile even the most stoic of people. Also, on a less savoury note, with no souvenirs you are less likely to stick out as a tourist, which will severely reduce your chance of becoming the victim of a pick-pocketing or robbery. There’s something about no-strings-attached travel that creates excitement and wonder. You truly begin to realise the worthlessness of material goods, the quick-fix stimulation of a new purchase which is all too soon replaced by further desires. There are no status symbols between backpackers, no segregation, no pre-determined judgements. Which is perhaps what makes it so easy to create new bonds and friendships whilst on the road. True value is to be found in the experiences and memories you share with others and the freedom of carrying nothing but a small bag of belongings helps encompass this to the maximum.